EDIT: There were actually 116 registered, + 13 rescue pugs, about twice as much pug loving going on. Today was the pug picnic, and Lilly is pretty worn out. Dad and I drove both pugs, Lilly and Princess, down to Springdale for the event. 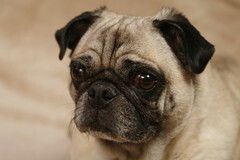 The Pug Picnic is put on by Pug Rescue of NWA, and done just about every fall at this time. It's late now, and she's snoring pretty heavily, showing her level of tiredness well. The event was a lot of fun. They hold contests like, curliest tail, longest tongue, and pug stuff like that. There had to have been at least 60 pugs there today. That's a whole lot of pug lovin' going on.